Celebrated picture book biographer Jeanette Winter shares the story of champion tennis players—and sisters—Venus and Serena Williams. Before they were famous tennis stars, Venus and Serena Williams were sisters with big dreams growing up in Compton, California. In the early mornings, they head to the tennis courts, clean up debris, and practice. They compete in their first tournament and they both win. From there, the girls’ trophy collection grows and grows. 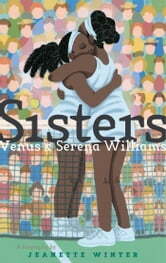 Despite adversity and health challenges, the sisters become two of the greatest tennis players of all time. This inspiring story of sisterhood, hard work, and determination is perfect for budding athletes or any young reader with a big dream.